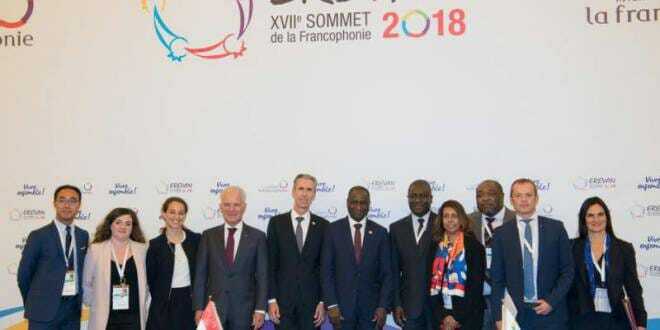 Gilles Tonelli, Minister of Foreign Affairs and Cooperation, headed the Monegasque delegation that took part in the 35th session of the Ministerial Conference of La Francophonie, held on 8 and 9 October 2018 in Yerevan, Armenia. In his speech, the Minister recalled that being a member of the French-speaking family is a basis for adherence to the fundamental values of respect for cultural diversity, cooperation between member States and Governments and the promotion of the rule of law. He concluded his remarks by announcing the hosting, in October 2019, of the 36th Ministerial Conference of La Francophonie, the theme of which will be “Reconciling Humanity and the Planet – Prospects in the French-speaking world on the eve of the 50th anniversary of the IOF”. An Agreement with the IOF to set the amount of the Principality of Monaco’s voluntary contributions, updating the commitments made previously. This relates to issues that are important for the Principality, i.e. French language learning (particularly for migrant and refugee populations), education (particularly for girls), young people (through its volunteer programme), preserving the environment and energy transition. An agreement with the Institute of La Francophonie for Sustainable Development (IFDD) to promote sustainable tourism in small island developing States and combating climate change.